A quintessential home away from home, Mihiri Beach House in Sri Lanka is located near the renowned Galle Fort and is a beachfront property with private beach access through the gardens. Featuring a tranquil and serene ambiance where guests can relax and regain their strength while spending time with their friends and family, the villa houses four bedrooms to accommodate everyone, even large parties. Head to town to explore the Dutch-inspired architecture or enjoy your private sandy shores while enjoying a view of the ocean! 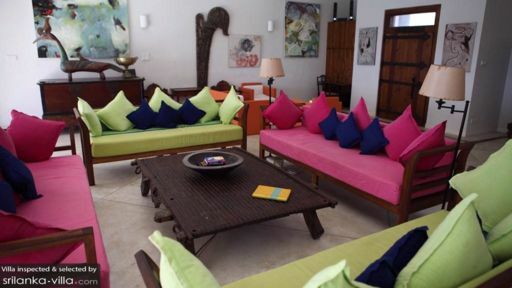 Mihiri Beach House is home to four master bedrooms – Pink, Yellow, Green, and Blue – depicting the colours of the tropic for a vibrant and cheerful ambiance. Each bedroom has been furnished with a four-poster, king-sized bed draped with cotton sheets for the most comfortable and peaceful sleep. The rooms are air-conditioned for your convenience, since days tend to get hotter. Soothing artwork lines the walls and wooden furniture exudes a cosy ambiance to make you right at home. All four bedrooms are accompanied by en-suite bathrooms fitted with a shower and other necessary amenities. A palm fringed tropical garden that extends out to the beach marks the outdoor area at Mihiri Beach House. The villa prides itself in offering a free-size swimming pool surrounded by verdant foliage where you can swim, laze around, and enjoy soaking up some tropical sun! Relax and rest up on the sunbeds that have been placed under the shade of a parasol or walk along the shore with the waves tickling your feet. There is even an alfresco dining area with a stone table and stools for a garden BBQ or picnic with friends and family. A spacious living room is found right beside the pool giving you full access to the deck so you can move around with ease. Furnished with comfortable and vibrant sofas as well as chairs, the living room is the perfect communal space where everyone can gather around for a round of drinks, snacks, and relaxation. It has been decorated with several traditional pieces and indoor plants to keep the room airy and refreshing. Glass doors allow natural light to stream indoors so you can avoid artificial lighting during daytime. Besides the alfresco dining area next to the pool, there is another indoor dining area in the living room with an eight-seater round table so you can enjoy delicious Sri Lankan offerings in comfort. A fully-equipped, western kitchen is found at the beach house as well, featuring a variety of modern amenities like hob, refrigerator, coffee machine for your morning fix, and others. 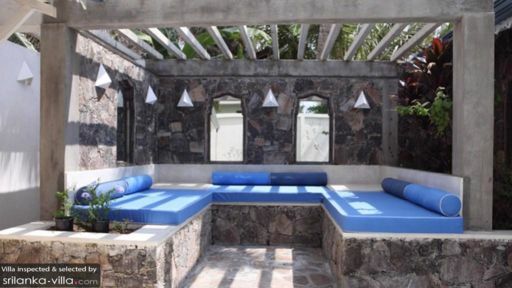 The beach house is equipped with all modern amenities and a kind team to look after guests and their needs. Personal guest assistance is offered to guests so you have what you require to make your trip all the better. Housekeeping, laundry, pool maintenance, and security are also offered to guests. If you wish, the services of a personal chef can be appointed to ensure your meals are top-notch. Found near Mihiripenna beach and Dalawella beach, the beach house is at a private location to give you the peace and calm that everyone craves after a busy time in the cities. The historical city of Galle with its Dutch fort that is a UNESCO World Heritage Site is only 15-minutes from the beach house so you can explore to your heart’s content! Lovely pool, rooms had everything you need, staff were charming and cooked us delicious food. The location was perfect for us, just a short walk to wijaya for swimming with turtles. All in all heaven! We loved our time at Mihiri. The main area was big and beautiful, as were the bedrooms (and very happy the bedrooms had air con!). The pool was fantastic, but the best parts were the welcoming staff and the amazing food from the Chef (seriously good)! We went with five adults and two kids (3 and 10 months). If you are going with young kids, be aware that the pool is unfenced (very common from what I researched) and there are concrete stairs, but this wasn't an issue for us at all. We walked along the beach to restaurants - there are plenty of lovely ones near-by, and the staff organised a driver for us to take us to a turtle hatchery, herb garden, tea plantation, the Fort and more. They were all worth seeing, but we especially liked the tea plantation! We couldn't rate Mihiri and it's wonderful staff high enough. We had the most amazing time and would recommend it to everyone! A group of 7 of us stayed in this beach house in March and it was an amazing stay! The bedrooms, living spaces, lounge areas, pool all have to be seen to be believed. The staff in the house are so pleasant and professional and the food we ate in the house was beyond all our expectations. Would thoroughly recommend this accommodation which is perfect for a group. Dom was amazing through the booking process and would advise to book direct through him. We spent 5 nights at Mihiri, the highlight of our trip to Sri Lanka. The staff at Mihiri are so friendly, courteous and go out of their way towards making your stay comfortable. Janaka, Suranga, Suresh and Subodu...thank you for all you did for us during our stay. We found Mihiri to be fun and relaxing. Our 4 year old son never got bored there. He always had something to do and got on fabulously with Kalu, the tsunami dog. The food at Mihiri is outstanding. Chef Janaka organized two barbecues for us by the side of the pool and was always happy to entertain our requests for anything we wanted to eat. He makes the best cheesecake I have ever eaten! Mihiri is so close to Galle and yet secluded from all its hustle bustle. It is at an accessible distance from nearly everything. Perfect getaway! Stunning location Amazing staff Beautiful house Great outdoors area Fantastic pool Fabulous beach There's very little else that needs to be said for this house. The house itself is unbelievable! Unlike a lot of holiday villas a lot of attention has been paid to the little details e.g. There are some amazing pieces of art around the house. There's a chandelier in the kitchen that catches the midday sun to create a beautiful light display! The guys who work in the house are fantastic! Really professional and friendly! They go out of their way to make sure you're enjoying your trip. About 8km from galle, 2km from unawatuna and a short 100m walk along the beach to a great beach bar! It was the highlight of my trip and I can't imagine how it wouldn't be the highlight of everyones. Mihiri Beach House did not disappoint - from the beachfront views to the numerous dining spots and double en-suite bedrooms, my friends and I couldn't have asked for more. The place is full of character with vibrant colours and an eclectic array of art. It was also a real treat to be wined and dined in complete privacy by the team of friendly staff. Great place in a fantastic location for exploring the Galle district - would definitely recommend.